Zlatograd is a small town in the Rhodope Mountains located just 2 km away from the Greek border and 60 km southeast of Smolyan. Zlatograd Ethnographic Areal Complex lies in the heart of the town. It is an open-air museum which is also part of the everyday life of local people. The complex comprises an ethnographic museum, workshops and an exhibition of water equipment. The tour around the complex starts from the museum in order for visitors to become acquainted with the history of the region before they move on. The museum consists of an archaeological collection, an exhibition telling about the occupations of local people in the past, costume collections, adornments and ritual items. The tour continues with a visit to the workshops. All of them are functioning and the visitors can see skilled masters who craft different objects offered for sale there. The tailor’s shop provides information about the traditions of this craft by showing interesting collections of old photographs, sewing machines, irons, scissors, and yardsticks. Original costumes from all parts of Bulgaria are sold there. Machines used for the production of woolen braids can be seen in the braid shop. The braids are woolen cords used for the decoration of clothes. The next workshop includes three different varieties of one and the same craft – saddle-making (production of saddles and packsaddles), harness-making (production of straps used for harnessing), and upholstery (sewing pads into saddles). In the cutler’s shop visitors can get a better look at the making of blank weapons, while at the goldsmith’s they can see a collection of ores and crystals from Zlatograd Region and watch the master-jeweler work. The brazier’s shop introduces the craft related to the production of copper vessels, while the wood-carvers demonstrate how to decorate wooden objects in their shop. The pottery shop attracts tourists with its various colourful clay vessels. The weaver’s shop comes last –traditional woven and knitted products can be seen there. One of the attractions of the complex is the three pieces of water equipment that still work even today: the tucking-mill, the fulling-mill, and the water-mill. They are located in a building known as Vuntsov’s Mill. The tucking-mill is used for washing, the fulling-mill is used for the processing of woolen fabrics, and the water-mill is used for flour grinding. Many Bulgarian holidays and customs are celebrated in a traditional style at the ethnographic complex, for example: Trifon Zarezan (the Day of the Vine-Grower - mid-February), Baba Marta (Grandma March Day – beginning of March), Todorovden (St. Theodore’s Day – the first Sunday of the Easter Fast), Enyovden (St. John’s Eve - 24 June), Waits (24 December) and so on. The Day of Zlatograd is celebrated on 21 November. After the tour around the complex tourists can sit and relax in some of the restaurants in the town or drink a cup of spun coffee made on hot sand and served in a special way. There are many hotels in Zlatograd due to the fact that the town is a popular tourist destination. 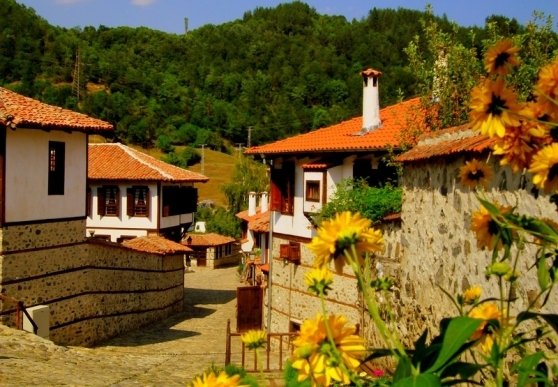 Accommodation is also available in the ethnographic complex itself – in an old house with authentic atmosphere from the Bulgarian Revival Period.